Snippets of Jack: "And it's not a bad look, really." "And it's not a bad look, really." If you look on your calenders you will see that in a week it will be Halloween. So i thought it would be fun to do a post about my favorite disguises/costumes that have been used by Jack and other characters throughout the series. 4. Elizabeth Disguised as a Man. Elizabeth Swann must really dislike her corset! She has disguised her self as a man to gain access on two different ships. First she stowed away on a Scottish merchant vessel after her fight with Cutler Beckett. She gave the crew quite a scare when she hung her dress out on the ropes; they thought a ghost had surely taken up residence on their boat. When she then lit some gunpowder on fire, the fire spelled out the word Tortuga. They must has gotten the message because we next spot her in her disguise trying to trick Jack and gain passage on his ship, Jack: "Come to join me crew, lad? Welcome aboard." Elizabeth: "I'm here to find the man I love." Jack: "I'm deeply flattered, son, but my first and only love is the sea." Well that settles that, Miss Swann. Jack does let her join his crew however, but only because he needs her to find Will, and eventually the heart of Davy Jones. 3. Angelica Disguised as Jack Sparrow. After Jack made his hasty escape from King George's dining room, He stumbled into his a bar called the Captain's Daughter. He had a nice chat with his Captain Teague (his father) who had just recently saved his life. It had been brought to Jack's attention that he was being impersonated, lucky for Jack his impersonator was at the Captain's Daughter as well. Jack went over to the pirate who he had been told knew where the impersonator was, and was directed to a back room. Upon arrival Jack found his a shorter version of himself awaiting him, They pair quickly engaged in a heated duel around the room but eventually Jack corralled his imposter (who identity he had discovered) against a post and being the ladies man that he was he kissed her. Jack: "Only one person alive knows that move [kisses the Jack impostor]...Always wanted to do that. Hello, Angelica. "Angelica: "Hello, Jack. Are you impressed? I think I almost killed you once or twice there." Jack: "I am touched at this most sincerest form of flattery. But why?" In a strange turn of events Jack imposter just happened to be a friend from earlier in life. Angelica told Jack about her poor father's plight, but the room was quickly invaded by redcoats, they fought them off rather well. And eventually escaped through a trap door which led to the river Thames. When they reached shore one of Angelica's crewman shot Jack with a poisoned dart and he was hauled off and press-ganged onto the ship Queen Anne's Revenge. 2.Jack's Impersonation of Justice Smith. Did you know our beloved pirate had a brief stint in the field of law? Well however brief it was he did it in style! Rocking a huge wig and dyed beard Jack presided over the hearing of his ever faithful first mate Joshamee Gibbs. Jack: "Now...what do we have here? "Gibbs; "Jack?" [The Jailor hits Gibbs with a club] Jack: "Not necessary! You were saying? "Gibbs: "Jack...Sparrow is not my name. My name is Joshamee Gibbs. "Jack: "Is that so? It says Jack Sparrow here. 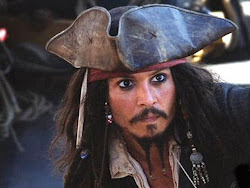 "Gibbs: "I told 'em, I'm not Jack Sparrow, who I would be happy to identify to the court, if it would help my case. "Jack: "I think that it would be a poor defense, unless you want to be bludgeoned again like a harp seal." Jack found a tricky way to sentence Gibbs, so that e could avoid the death penalty. He reunited with Gibbs on the prisoner transport wagon, Jack thought he had paid the driver enough to get them to their destination, but apparently the King paid him more. When Jack got out of the veihicle he was immediately captured and taken away for his a fore mentioned meeting with the King. 1. Pintel and Ragetti Disguised as Damsels in Distress. Sometimes its tough to be a pirate. For Pintel and Ragetti this was on of those times. While the rest of their fellow crew mates got to go gallivanting under the water on their way to a fight, they had to dress as woman and distract the Navy men from a small sail boat. The plan didn't exactly work however; while Pintel and Ragetti were arguing their boat drifted into the moonlight and the Navy men saw what they really were, not just men mind you but cursed men. When the light struck them they turned to skeletons. And not very attractive ones at that. Clever post tying in Halloween with Pirates! Awesome! Thank you so much! Be sure to vote on the poll and follow the blog!